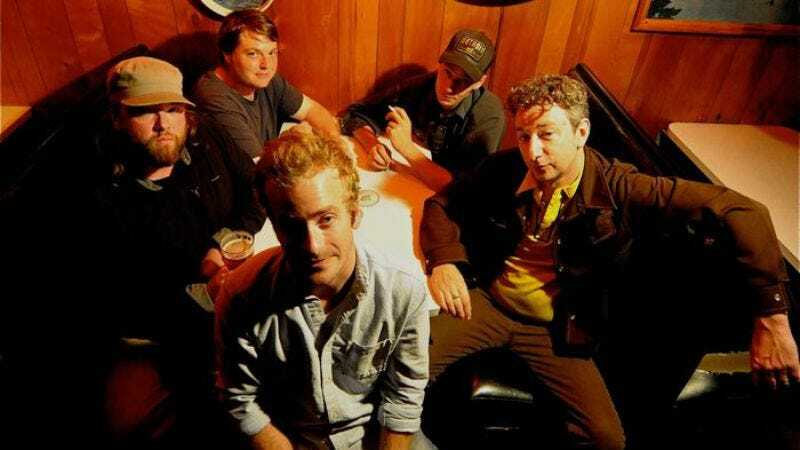 Trampled By Turtles’ 2010 album, Palomino, was a well-deserved breakthrough hit for the Duluthian bluegrass band, but that doesn’t mean bandleader Dave Simonett is shackled to a single style. With Dead Man Winter, a side project also featuring fellow Turtles Ryan Young and Tim Saxhaug, Simonett explores his country-rock side. The band’s debut disc, Bright Lights, echoes the rootsy, world-weary vibe of predecessors like Neil Young And The Band, as well as a more homegrown strain of Minnesota heartland-rockers like the Gear Daddies and the Glenrustles. It’s certainly not a drastic shift from the Turtles’ music in either sound or spirit; instead the new band’s sound is compellingly different but complementary. Bright Lights even shares a version of the song “New Orleans” with Palomino. The A.V. Club talked with Simonett in advance of Dead Man Winter’s show Saturday at The Sett about balancing his two bands. The A.V. Club: The ironic thing about Dead Man Winter is that Trampled By Turtles is known for being so fast and frenetic, but almost entirely acoustic—and in your electric band, you’re slowing way down. Dave Simonett: Yeah. [Laughs.] My band with drums is definitely my quieter band. I just wanted to make a record with a little different instrumentation. I live in Minneapolis, and most of the other guys are up in Duluth, so they’re not around. I didn’t really have any plans to make a band out of it. I just missed playing the drums and the electric guitars, things that I had done in the years before Trampled. I mean, Trampled has been touring for, I guess, going on nine years now. And, though I love it, it’s not really my only taste in music. I like to play with other people, just to switch things up a little bit in my own head. I’d never been in a band that sounded like this before, so it was exciting. It felt like a familiar territory, though I’ve never done it before. With Trampled, the base—whether we add other things to it or not—is pretty much the same for most of the songs, which is the five of us and the instruments that we play. Whereas with Dead Man Winter, it’s more my own project, so there’s really no framework to start from. It’s a little more liberating to take a song that way—after it’s been tried with Trampled, I can try whatever I want with it. AVC: There’s something quintessentially Minnesotan about the themes of winter and cold running through Bright Lights, which I suppose is also right there in the name of the band, Dead Man Winter. There’s a certain bleakness and desolation of mood on a lot of the songs. DS: I think it’s kind of inescapable. It’s trying to be as honest of a songwriter as possible. You can’t really escape where you’re from—particularly [being] from Duluth, where it’s even darker and colder. A lot of that same current runs through a lot of the bands up there, and I think it’s just part of our character. And it doesn’t mean that’s all you have to do, but I think that, whether a song is a true story or not, if you’re writing from an honest place, then it’ll be colored by where you’re from. AVC: There are a few road-weary songs on here too, like “Get Low” and the title track. DS: Yeah, and, to be honest, I tried to avoid that for so long. Trampled’s mandolin player used to make fun of bands that, after years of touring, all of a sudden all their songs are about being on the road, you know? But, it’s what we know. This is daily life for us, so it’s bound to seep in there. What happens to me a lot, with songwriting, is that I won’t really get the picture of the song until it’s done, and I hear it, and then [I say], “Oh! You know, that’s what that’s about.” It’s almost a blind action when it’s happening, and then it kind of comes together for me afterwards. AVC: You just got back from a tour through Colorado and Alaska, some very mountainous country that also seems to fit the songs. DS: Erik [Berry, mandolinist] just had a baby, so Trampled had two months off, which is why we decided to put the [Dead Man Winter] record out at this time. And I just had this little amount of time to tour, so we decided to go to a couple places that we really loved. Colorado and Alaska, for us, it’s a thinly veiled vacation. We took some days off in both places and got to explore and relax and play in a really informal scene. It’s not like you’re going to a showcase in Manhattan or Austin or something. You’re playing at bars with a pretty young audience, and you’re in the mountains, so it’s really just for fun. AVC: In Colorado you played fairly big cities, but in Alaska, a couple of these towns I’m not sure I’ve even heard of. DS: [Laughs.] Yeah, you wouldn’t be alone on that! AVC: It must’ve been an interesting experience playing such small, isolated towns. DS: It was. Trampled went there last year also. And the reason I even knew I wanted to go there [is that] back when we all lived in Duluth, a couple of us worked at Pizza Luce, and—for whatever reason—a handful of people from that place moved to this tiny town in Alaska called Skagway. And so, when Trampled was deciding to go to Alaska, we really wanted to go there. And there’s not really any venues in this town. They just kind of make a venue if a [touring] band is there, which is a pretty rare occurrence. They find a bar, and they find a PA or whatever. It’s really something. There’s always a local band, but sometimes [you’ll be] the only band that travels in from out of town for a year, or even two years. So it becomes this huge occasion in town when a band shows up. People come out whether they’ve heard of you or not. And they’re really interested in the music. They just seem to be happy that someone drove all the way up there to play. AVC: What can you tell me about the new Turtles record? Are you going in a different direction from Palomino? DS: I have no idea yet. We’ve actually gone really blind into the studio this time around. Most of the songs that I have, we’ve never played before. Which is exciting, because a lot of times when we go to record, a lot of the songs have been played on the road a lot, and everybody knows what they’re doing ahead of time—which can be very efficient, but a lot of times might kill a little bit of the creativity that the studio can bring out. So I’m going in with 10 or 12 songs that I’ve just heard [as demos] with me and the acoustic guitarist, so I don’t know which way it’ll go.